Authors Grady Klein and Yoram Bauman (the world’s first and only stand-up economist) have written two comic books – or graphic novels? – on economics. I review their volume two: macroeconomics here and now. The book addresses students and is offered as an ‘accessible, intelligible, and humorous introduction to unemployment, inflation, and debt’ (cover). It is praised by Gregory Mankiw (the textbook writer) and Hugo Sonnenschein. And that already points to the problem of the book: it is completely mainstream and does not lead to interesting questions that are debated but to standard answers to standard questions. Many of these have been wrong almost all of the time. On page 135, a ‘money doctor’ advises a poor country central banker: ‘If you print too much money, you’re just going to get inflation’. That monetarist myth was discarded decades ago and should not be represented as something that economists agree on. On page 144, fixed exchange rate regimes are depicted as unstable. However, China has successfully run a strategy of an undervalued exchange rate, just like Germany and Japan did before. Page 158 shows that it was bad monetary policy that caused the Great Depression: a fall in the money supply, attributed to monetary policy, did ‘it’. Again, there is no consensus among economists that this is what happened. After all, even with quantitative easing it seems that central banks today have problems to stop the fall in the monetary aggregate. Of course, central banks set interest rates today and not monetary aggregate targets. The last point I want to mention is the idea of the financial system (p. 163) of a system that transforms savings into investments. Again, in today’s economy that idea is wrong. Money is created out of thin air by keystroke in central banks and also banks. 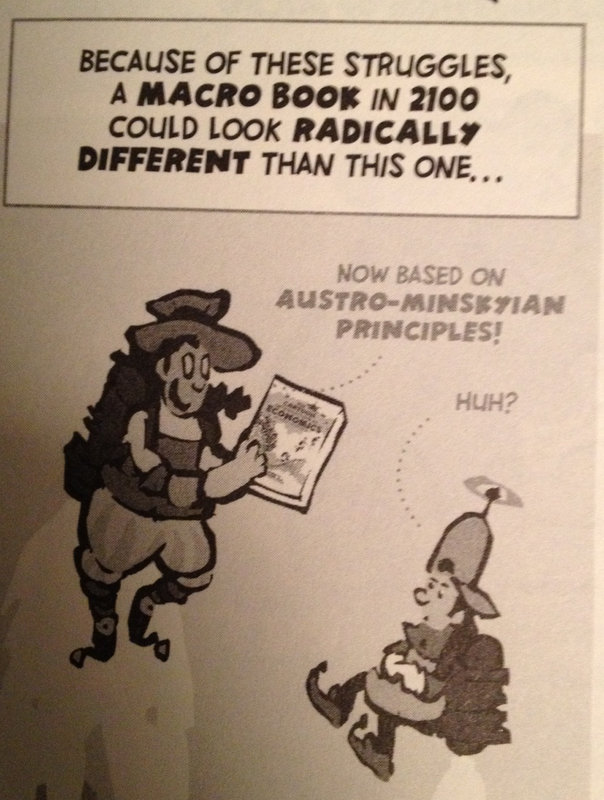 The book is actually not bad, and some of the little jokes on the side made me smile (see below). However, the economic ideas are those of Mankiw and others which believe in free markets and cannot see any complications that would make government intervention a good idea. As in the original textbooks, historical episodes are interpreted from a supply perspective and no consideration is given to demand problems. The Japanese balance sheet recession, Argentina after the currency board, austerity policies and bad debt? It’s not in there. Problems of distribution are non-existent. In the chapter on trade, those that lose their jobs always find new employment. You would be hard pressed after reading that book to understand how unemployment rates in Greece and Spain could stand at 25% and not show any inclination to come down. Perhaps the authors are interested in writing a heterodox introduction to economics? I think that this would be a splendid idea.